Texas Independence Day marks the date that Texas became an independent Republic. Texans annually celebrate on March 2nd with parades, festivals, events and family festivities. It is a proud day in Texas history, ya'll. You may be looking for some great engaging resources and ideas on how you can bring this celebration into your classroom. I loooove teaching Texas history through math and reading as it presents so many advantageous cross-curricular connections. Students in kindergarten, first, and second grades enjoy hands-on learning activities for math. 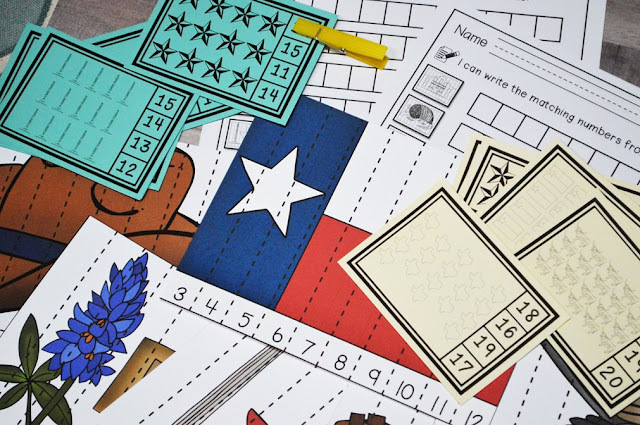 This is exactly why I used this modality for this special bundle of math centers to teach about the state of Texas' symbols. Number puzzles are some of the most beloved math centers in my classroom and that has been the case in every grade I have taught! Kids are drawn to games! Plus, they love a challenge. - Students need to unscramble the pieces using sequencing skills. - There is a printable support mat for diverse students who need help organizing the puzzles pieces as they go. - It includes English and Spanish recording sheets where students will write the number sequence from the puzzle down so they are learning and working during math centers. *BONUS: The recording sheets hold students accountable AND it creates an additional opportunity for them to practice writing their numbers. - I have seen tremendous progress mastering counting backwards since I have found ways to integrate it into our learning more frequently. - There are eight pages or 24 clip cards. - The most common use of clip cards is using a clothespin to mark the number that matches the set shown on the card. - You can also laminate and use dry erase markers to mark the correct answers. - There are 8 printables included in English and Spanish. I use these centers for two weeks in my classroom. Since the number puzzles come in a set of 10, I have my students complete 5 puzzles within one center per week. The students really need the extra time to record their work instead of doing more puzzles. I pair the Math Center Bundle with another Texas-sized bundle that I have been using for awhile. It comes from Rachael of Sweet Sweet Primary. (She makes the cutest centers for the K-2 classroom.) Each component of the Texas bundle is unique and allows me to meet literacy standards as we go through our Texas unit. Plus, there are many great things I can use for a quick bulletin board display. - I tape the colorful Texas symbol cards around the room. Students walk around during literacy centers and match the symbol on the card to the symbol on their paper. They use the card as a scaffold to spell the words. - Students answer questions and build a cowboy based on their answers. - When finished, we display them all together to graph how many students in our classroom have done each activity. - This is one of the activities that make a great bulletin board! - I follow the same procedure as listed above taping the cards around. 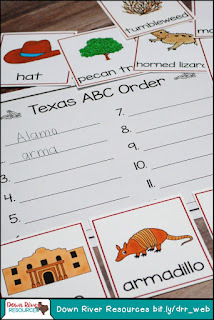 - ABC order is so tricky for students and it is great to find a set of cards that has a couple of words that begin with the same letter. - This is the time of year where I want to start challenging my students! - Personally, I think this is where you get the Texas-sized value. - My favorite component from this resource is the mini-book of Texas Symbols. It has two variations so its provides another way for me to support diverse learners in my classroom. I have a few kiddos who need occupational therapy and cannot use their hands well. There is a completed book that students just need to color. This is a terrific way that I can modify the book to allow my students to participate along with their peers. There is just too many things that I love about this bundle. You'll just have to check it out for yourself! 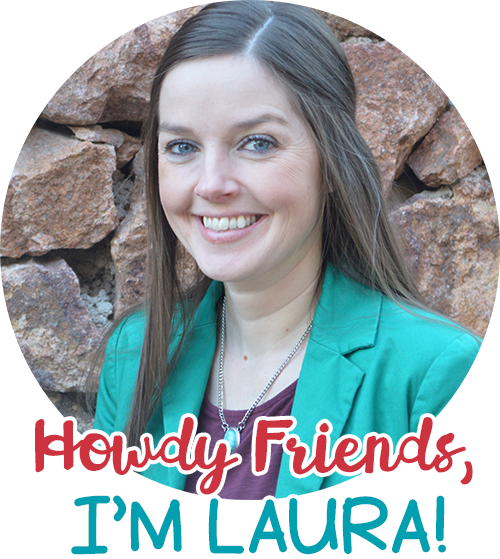 I hope this inspires you to celebrate Texas history and maximizing on the opportunity to teach social studies through math and reading and if you want to use my math centers or Rachael's literacy centers you can find them in our TpT shops. What is your favorite Texas activity to use in your classroom? I love the number puzzles! My littles have such a hard time learning to count backwards. These puzzles are perfect!